Since it’s wintertime, I decided to cut back most of my herbs in my little container garden. Once they were done drying, I was eager to try them out. 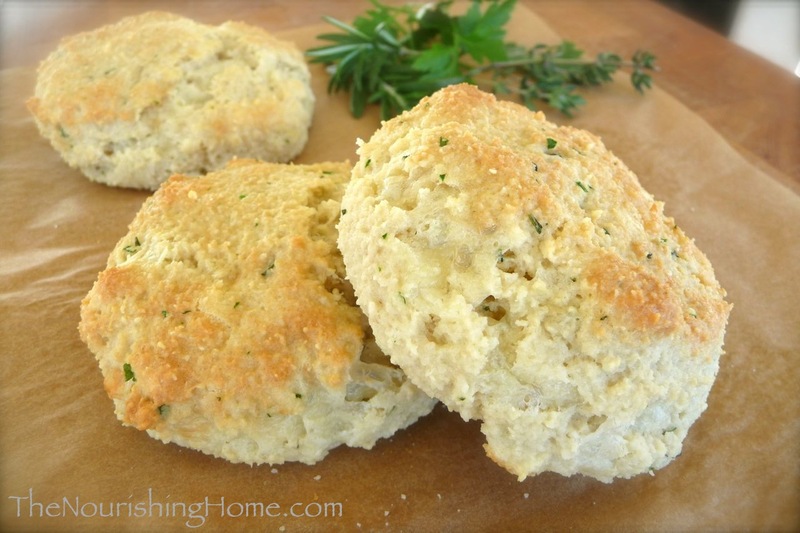 So I decided to use an assortment of these fresh-dried herbs to make these delightful grain-free biscuits. I usually make them with fresh herbs (as shown in the photo), but I’m happy to report that they are just as tasty with dried herbs too! These light and fluffy, yet filling, biscuits are just a simple twist on my popular Almond Flour Biscuits recipe. We find these savory little fellows to be the perfect accompaniment to hearty wintertime soups and stews, as well as roasted chicken. We hope you enjoy them too! Preheat oven to 350 degrees. In a medium bowl, combine almond flour, cheddar cheese, herbs, baking soda, salt and garlic powder. In a small bowl, whisk together the eggs and buttermilk until well combined. Using a spoon, stir the wet mixture into the dry mixture until thoroughly combined. For quick and easy drop biscuits: Drop biscuit dough by large spoonfuls onto a parchment-lined baking sheet, placing the biscuits approximately two-inches apart. For classic-style rolled-looking biscuits: Scoop a large spoonful of batter into your hands and roll into a ball about the size of an apricot. Then place the dough balls on a parchment-lined baking sheet and gently flatten using the palm of your hand. Bake about 15 minutes, until golden brown on top and a toothpick inserted in middle comes out clean. Serve warm with butter. These make the perfect accompaniment to hearty soups and stews! Do you have an herb garden? What are your favorite ways to use and preserve your fresh-grown herbs? How to Season and Grill Veggies Like Pro! These sound amazing!!! I am making these for dinner tomorrow with my soup! yum! These look so good & simple to make! My only issue is that I don’t know where to buy buttermilk. I’ve never bought it before when I lived in the States & now that I’m in Jordan, I don’t know what to look for to make sure it’s good quality. Do you have any suggestions? Or is there something that I can substitute for the buttermilk? What is grassfed cheddar? Does this refer to the cow that they get the milk from for the cheese? Thanks, sounds delicious. These are the first bisquits I’ve had in over a year (since going GF). They are delicious and the texture is just right. I used Italian seasoning (no fresh herbs in the house), smoked applewood cheddar and coconut milk. I ended up with 10 bisquits, must be a bit smaller than yours. I cooked them in a glass pie plate. Thanks so much for this recipe, I’ll definitely be using it again! At this time I do not have almond flour, would WW or white flour be as yummy? Do you just scoop spoonfuls onto a baking sheet? Or do you shape them, or use a special pan? Thank you for this recipe (and so many others I use regularly! ), can’t wait to try this! Haha! You are so cute. And I thought I was asking a dumb question lol. I agree, the ones pictured ARE very pretty! no dumb questions, just a forgetful recipe poster over here! 🙂 thanks again! These look yummy. I want to make them for someone lactose intolerant though — do you think I could substitute plain kefir for the buttermilk? If not is there anything else you would recommend? Thanks! I made these tonight ……. so very good !!!! Have you tried making these with unblanched flour? Just curious how they will turn out (couldn’t find blanched). Also…the nutritional content of these scares me a little bit! Hi Kelly, thanks for the info. Unblanched turned out just great. Yes I was referring to the fat and calorie content – part of being healthy is not just consuming unprocessed food, but maintaining a healthy body weight. Giving some thought to energy consumption vs expenditure isn’t a bad thing, particularly when eating something new (like these biscuits). These are amazing! I made them tonight with some grassfed beef stew. I love herbs & garlic, so doubled those, as well as the cheddar. I was out of buttermilk, so subbed with full-fat Greek yogurt and 1/2 tsp. of cream of tartar. Was going to make a different GF bread recipe for Thanksgiving dinner, but will be making this again instead! Pure awesomeness. Thank you! These have become a regular favourite in our house. I like trying different cheeses and spices. The recipe works very well as is or with modifications. I love it! Your site is also one I recommend to friends who are looking in to gluten-free/whole foods eating. Thanks for all you do. This site is a real blessing! My husband and I are trying to eat healthier but we have not yet converted to the GF diet as we are neither gluten intolerant (that we know of). Will the biscuits turn out as well if I use my freshly ground wheat? Can I simply remove the cheese (currently dairy free) or will that throw the recipe off? I’m making your beef stew tomorrow and would love to have these as well. Making these tonight along with your Gluten Free Crockpot Stew! My husband has had to go GF, which has prompted me to search out new recipes to try. I have to admit, I’ve not wanted to make stews, since the ‘bread’ part of it was always such an integral component to me–I’m really excited to give these a go. I am following your meal plan for the week–thank you for publishing it with links to recipes–and this is on the list. I just have to say, I loved your Fluffy Little Almond Flour Pancakes so much that I couldn’t bring myself to use all that expensive almond flour for these! It’s all going to have to go to pancakes! I ended up following a suggestion you made above to use a whole wheat biscuit recipe and modify it by adding the herbs and cheese. They are baking now, so we’ll see how it turns out. I just want to thank you again for sharing your recipes with us. They have certainly gotten me out of my comfort zone and let me try new foods that I really love! I did not expect to like the Hearty Lentil Stew (kale? lentils? sweet potato?) but made it because it sounded healthy. I ended up really liking it! My oldest son has nut allergies, is there another gluten free flour that I can use? You have many yummy sounding recipes that I want to try, but contain the almond flour. What is the best GF substitute to remain “true” to your recipes? My kids gobbled these up! Even my 3 year old helped with the baking! Thank you for sharing your recipes so freely. Your hard work blesses my family. I am new to your site and love your recipes. For these biscuits, could almond milk be used instead of buttermilk or coconut? Thanks for sharing so many geautiful recipes. Hi there! I’m new to your site and my kiddos and I have loved every recipe we’ve tried. I was wondering if these biscuits freeze well? If so, about how long would they last? Thanks so much for all of your hard work.